Greetings! Yes, it has been a while since the last post, but between being laid off, a knee injury (exercise hurts! ), and both Mom and I generally feeling like a pile of crap, we just hadn’t gotten around to doing a review – until today! 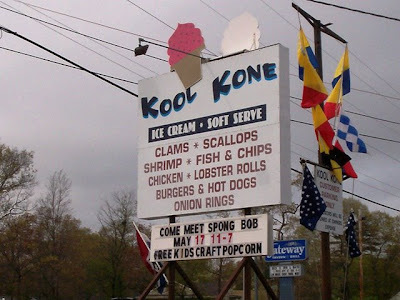 After reading several fantastic things about Kool Kone, a Wareham clam/ice cream shack, and after spotting it one day on our way back from the Cape, we decided to give it a shot. Mom and I can’t resist a good clam shack, and it looked quite magical when we passed by last week. We pulled into the parking area at around 3:30 p.m.
It’s not like you can miss the place. 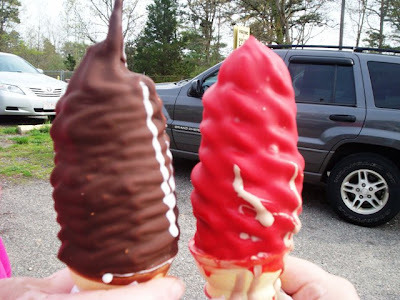 Located right on Route 6 just over the Marion border, it’s a giant red building with ice cream cones on the sign. Enough said. Now when we had driven by a week ago, the place was packed. I mean packed. People all over, cars everywhere parked facing different directions – it was a madhouse. No thanks, but since New Englanders love all things seafood and ice cream, I was expecting the same crowd today. I was very pleased to have arrived at that odd time between lunch and dinner, i.e., there was no one breathing down my neck when we placed our order. Because we’d never been there before, I asked the polite girl behind the counter what their process was on delivering/picking up an order. She asked where we would be sitting: inside, outside patio, or carside. I told her that we’d be on the outside patio, so she told me that she would be calling our number (she handed me a receipt) over the microphone. 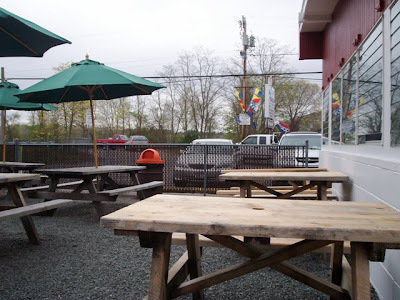 I took my receipt and headed to one of the umbrella-covered picnic tables on the patio. What both Mom and I liked about the whole setup of Kool Kone was that everything was labeled (ordering windows, pickup windows, etc.) and everything was very clean. 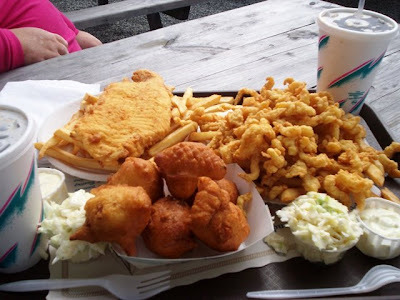 Clam shacks are notorious for being pigsties, especially on busy days, but this was more than just a clam shack. This was a nice restaurant that just happened to serve food outside. Oh, and there is one tidbit of information that MUST be included – they have restrooms!!!! Thank God! Very nice, clean, normal restrooms (not Porta Johns). It didn’t take long before our food was ready, and before the place started filling up. When we first arrived, there was only one other family sitting on the patio. Now, there were about four or five, and there were more on the way. When I retrieved my food, I noticed how large the portions were. You certainly get a lot for your money here. I’ve paid way more for a much smaller platter of clam strips at other restaurants. I was just hoping that everything tasted as good as it looked. Both plates came with a side of cole slaw and tarter sauce, and both of those things came to me since Mom doesn’t like them. I didn’t mind, though. The cole slaw was delicious and the tarter sauce was nice and tangy. Mom’s regular order of fish and chips was actually quite large. It was a giant fillet that had a thin, crisp batter and was very white and flaky inside. She said that it was perfectly done and had a delicious taste. The fries that were hiding underneath the fish were tasty as well. My clam strips were excellent. They were very sweet and you could eat them with your hands and not have greasy fingers afterwards. I love this dry way of cooking. It’s almost like the seafood is baked, even though I know it’s fried. I hate greasy food, so I just love when restaurants focus on the taste of the fish rather than the crunch of the batter. Both Mom and I shared the six large clam cakes which were fantastic! The batter tasted like lightly buttered toast, and the inside was fluffy and filled with fresh clams. We really did have a ton of terrific food for a lot less than we would have paid at a dine-in seafood restaurant. 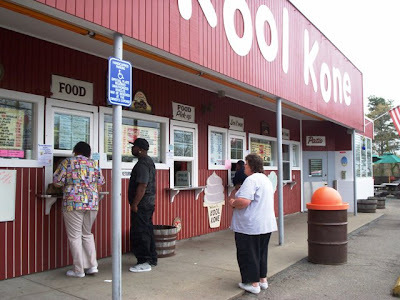 Now … since this is called Kool Kone, we couldn’t leave without getting a cone of ice cream. 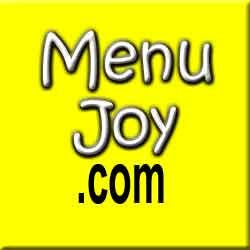 It was our duty to the fans of this Web site. We are food martyrs. Before heading back to the car, Mom and I decided to get a small soft serve cone (they sell both soft and hard ice creams). We had seen a few people walking with beautifully dipped cones earlier on, so we just had to be followers and do the same. Now, the one time I had gotten an ice cream with a dip on it, it melted all over my hand and I threw a tantrum over it (see: Sea Swirl). I was hoping for a better experience this time around. I ordered a small chocolate cone with cherry dip, while Mom chose a vanilla cone with chocolate dip. Our total came to $4.70. We took our cones and what was left of our Diet Cokes and headed back to the car. As we did this, our cones started to melt! You can even see it in the picture. My world was starting to crash down around me, but I remembered that I now carry Wet Wipes with me at all times, so a second fit wouldn’t have to happen. Mom and I decided to eat the ice cream cones outside of the car, and that was certainly a good idea. I’ve never eaten ice cream so fast before, but we were able to enjoy the tasty ice cream and the sweet, candy-like coating. It was a fast and fun dessert, and it was our pleasure to have sacrificed ourselves in order to provide an excellent review. Kool Kone doesn’t just serve seafood and ice cream. I overheard someone talking about ordering a linguica plate and shrimp Mozambique. What a find at this type of restaurant! What I also overheard was a woman saying that she “loves places like this,” and so do we. You can basically get anything you want, you can eat outside, the price is right, and the taste is out of this world. Plus … bathrooms!! 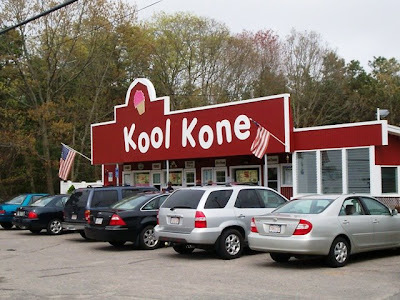 You really can’t go wrong with Kool Kone. We will be paying many, many more visits before summertime ends.